Diecutting mold stamping rigid foam cutting machine is the gerson machinery for die stamping the rigid foam sheet material including the following foam :Rigid Non-absorbent Waterproof Foam Polyethylene Foam , Pe Foam ,Polyethylene Foam,Pvc Foam Skirting Board , Pvc Foam Board,Rebind Eva Foam, Rigid Eva Foam sheet,High Elastic Hard Foam. 1.The foam cutting machine is widely applicable to cutting of various shapes from rigid foam .Infact ,it is e a large-scale cookie cutter, great for cutting exact shapes out of foam . 2.Double oil cylinder and precise double-crank connecting rod balancing mechanism are adopted,which can gurantee that the cutting depth at every cutting position is the same.The central oil supply automatic lubricating system guarantees machine precision and prolongs service life of machine. 3.Just place the Sheets of foam over the plates and compressed by up to 500 tons of pressure. The foam is forced down over the blades, cut to shape, and released, creating a form exactly matching the design on the plate. 4.The foam sheet die cutting machine of special specifications can be specially designed and manufactured by Gerson according to customer production requirements. 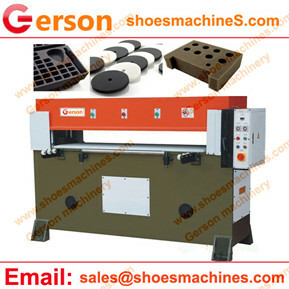 5.Any question ,please contact to Gerson machinery.